What Positive Change Will You Make this Earth Day? Make a Major Positive Impact at Your School, Job, or Organization. Learn how to decrease plastic waste, and simultaneously help your fellow students or colleagues save money. 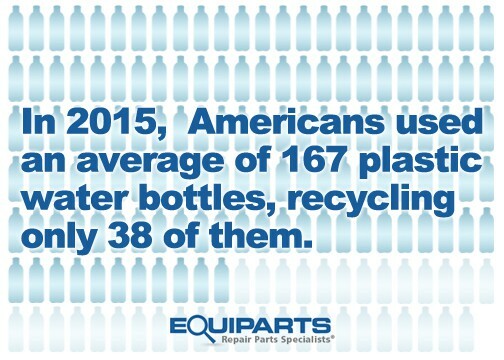 Last Year, the average American used 167 disposable water bottles and only 38 of them were recycled. In total, the U.S. consumes approximately 31 billion liters of bottled water per year. About 4 billion of those bottles end up in the U.S. waste streams, which costs municipalities about $70 million annually in disposal costs. So, how can we decrease plastic waste, and encourage environmental responsibility? By utilizing new technology that encourages the ideals of reducing our footprint, reusing products, and recycling materials. Hopefully, you are currently doing this yourself by recycling at home and drinking tap water. But let’s go a step beyond you, and talk about how to encourage environmental responsibility on a larger level. How do the places you frequent – your workplace, your child’s’ school, even the park you walk your dog through – encourage sustainability? Is there anything in place that perpetuates the idea of reduce-reuse-recycle? If not, then here is your opportunity to make a positive environmental impact where you live. Become an advocate for change and push for bottle filler water fountains. 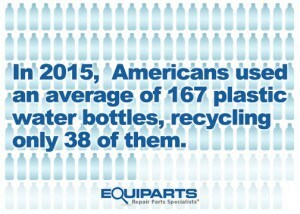 Instead of using 167 disposable water bottles, encourage a sustainable change to one reusable bottle that can be used year after year. Learn what makes ezH2O bottle filler units Green Spec certified, and the eco-friendly features of these particular units by reading Part 2 of Becoming Water and Energy Responsible in 2016: Go Green with Elkay’s ezH2O Energy Saving Bottle Filler. Plus find out about a company that makes really cool reusable water bottles, too!